Weighing under 25 pounds and with a footprint of less than 5 square inches, the UR3 is Universal Robots' smallest collaborative robot. It's ideal for light assembly tasks and automated workbenches. But this small cobot packs a big punch, with payload of over 6 pounds and reach of nearly 20 inches—plus a 6th axis that can rotate indefinitely. These features make the UR3 the most flexible, lightweight collaborative tabletop robot available. It's an ideal choice for applications that require 6-axis capabilities and where size, safety, and costs are key parameters. UR3 robot applications span manufacturing industries from medical devices to circuit boards and electronic components. Because of its compact form and easy programming, the UR3 is easy to move between tasks to meet agile manufacturing needs. Let the UR3 be a “third-hand helper” that reduces the need for two workers on a single task. It can be mounted on a table or mobile cart for picking, assembling, and placing parts in optimized production flows. And the UR3 is perfect for small-format, precision tasks such as assembly, polishing, gluing, and screw-driving applications that demand uniform product quality. The UR3 doses the same amount of glue with constant and steady pressure along a narrowly defined path, and tightens screws with exact torque—time after time, day after day. 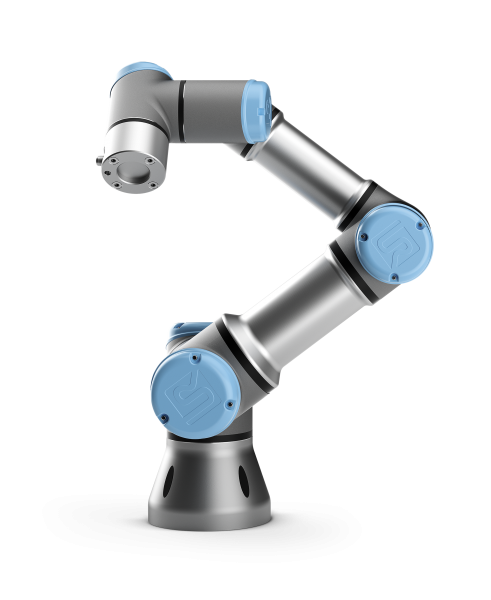 The UR3 robot is built with the same proven collaborative technology as the larger Universal Robots UR5 and UR10 robot arms. All three collaborative robots feature the same safety system and 0.1mm repeatability. The UR3 has a default force sensing of 150 Newton but can be set to stop if it encounters a force as low as 50 Newton in its route.